Happy Friday! How was your week? We actually had a great week and we have MOPs today! We have a super busy weekend and I’ll share more on that next week! It is all still top secret! Shh! I’m linking up with some of my favorite bloggers today for my Friday Five. 1) Guest Blogging Today! – I’m super excited to be guest posting over on the Missouri Women’s Blogger Blog later today! I’m talking about celebrations and having a quick tear remembering when Miss H turned One! 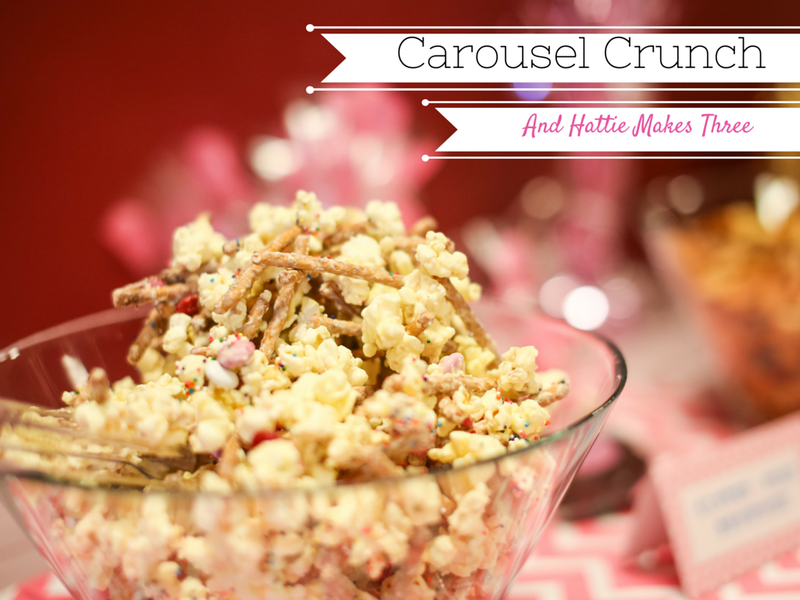 I’m also sharing my Carousel Crunch snack mix recipe! (Perfect for Super Bowl!) If you’re in Missouri, we’re looking for new members, so be sure to join and tell them I sent you! 2) Pardon MY French – I’m officially addicted to grey sweatshirts with saying. This one came this week and it makes me giggle. Not sure I can wear it to church, but fun for running errands! 3) Swimming! – Yesterday, we decided to try out a new tot time for Miss H and her cousin E. I may have gone a little swimsuit crazy lately, but Target has THE cutest stuff right now. This one just cried Liberty of London to me and of course I needed the cover up to go with it. We also have a flamingo love in our house, so this and this came home with us too! 4) Target Shenanigans – Sometimes, you and you BFF go to Target and do silly things. We were picking up goodies for her cruise this weekend and I am on a quest to get a bow board hung on the back of a door. For real, sometimes, it’s the best just being goofy with your people. They get you. Also, I actually got dressed, did my hair and put on makeup. Let that be on the record! 5) Noodles & Company – Last Night I got to attend a very special Blogger Tasting Dinner at Noodles & Company. You may recall I went to one last year and it was equally yummy! Look for a full review next week! I could not get enough of these pot stickers. They know my love language! That’s all I’ve got for now! Have a great weekend! This post contains affiliate links. Thank you for supporting the brands we love. I couldn't pass up that swim suit either! Olive and Hattie will be rocking them this season and I kind of wish it came in my size. There were so many cute options and with the less than $15 price tag I couldn't help myself. I love Noodles and Co and wish we had one in my city. Maybe one day 🙂 Hope you have a great weekend! That Carousel Crunch snack mix looks good but I am really biased because I haven't seen a snack mix I did not like! love that sweatshirt! Heading to check out your guest post now! Totally signed up for the MO Women's Bloggers yesterday! That carousel crunch looks so yummy! How did you have a birthday party at the zoo in January? I am definitely looking for ideas for Lucy's January b-days to come. Happy weekend!